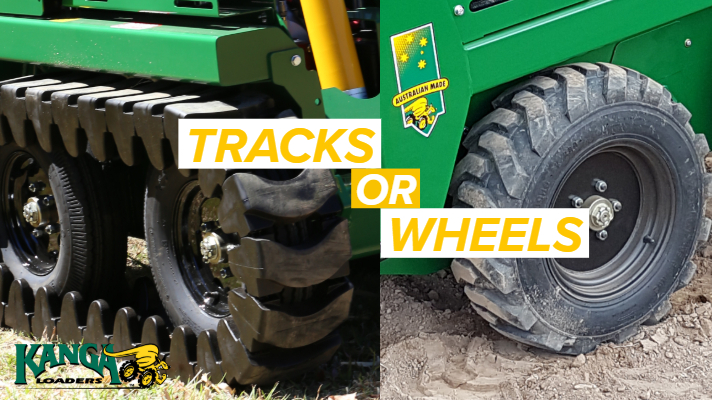 What is best: tracks vs wheels? The age-old argument, tracks vs wheels? We often get asked which is best but the answer lies with how you intend to use the mini loader… Whether you’re working in construction or agriculture, knowing whether you need tracks or wheels is down to how you intend to use the machine. Tracks are beneficial on wet and less likely to tear up a freshly laid lawn but if you’re working on concrete regularly then steer clear and opt for a set of wheels, you’ll get greater ground speed and life as the hard surfaces can cause premature wear on tracks. A wheeled loader gives you broader options for working in different ground conditions. Kanga’s heavy-duty wheel construction provides traction and lasting wear across a range of ground surfaces from concrete or asphalt to gravel and dirt. Our wheels come in different tyre options, depending on your conditions. Waterfilled for more weight, stability and traction, airfilled for lighter grounds such as turf or lawn and foam filled, which is puncture proof. Kanga wheels are also available with Kanga’s resealing puncture proof solution to make your wheels even more wear-proof in yards on streets or the factory. Kangas tracked wheel system is a unique configuration and different from many other tracked systems on the market. Kanga’s unique tracked system has no undercarriage requirement, so you get a higher ground clearance than the average tracked mini skid steer loader. A flexible track which means no see-sawing effect over uneven land. Thanks to the increased ground coverage Kanga’s tracks create a consistently more stable ride and the ability to tackle undulated grounds. This is ideal for when you need to get the job done quickly under any weather condition. The flexi-track gives you greater traction than wheels on loose surfaces such as sand or very wet conditions. For more information on our range of mini loaders click here, or get in touch with us on Facebook.